Maria Health Care Center, in Baltimore, operates a facility of 32 certified beds, serving both short-term and long-term residents. A nonprofit organization that has been in business for 60 years, it is owned by SSND Care, Inc., otherwise known as the School Sisters of Notre Dame, a religious organization that conducts missions in North America, Africa, and Asia. This facility's full name is "Villa Assumpta and Maria Health Care Center." It is conveniently located less mile from GBMC. We are nursing home lawyers. We find flaws in and pick apart these nursing homes. But this is such a hard nursing home to criticize. With top 5-star Medicare ratings straight across the board, including an overall 5-star rating, Maria Health Care Center is almost in a class by itself. Its impressive achievement may be traceable in part to the strong religious and philosophical motivation of its operators. Maryland needs less big chain nursing homes and more facilities like this. Another factor behind its top scores may be its size: this Baltimore facility has just 32 certified beds - all occupied, at last official count. Attractive as this facility appears, based on its inspection scores, it currently has no vacancies. Maria Health Care Center Nursing Home, in Baltimore, operates a facility of 32 certified beds, serving both short-term and long-term residents. A nonprofit organization, it is owned by SSND Care Inc., otherwise known as the School Sisters of Notre Dame, a religious organization that conducts missions in North America, Africa, and Asia. This facility's full name is "Villa Assumpta and Maria Health Care Center." With top 5-star Medicare ratings straight across the board, including an overall 5-star rating, Maria Health Care Center is almost in a class by itself. Its impressive achievement may be traceable in part to the strong religious and philosophical motivation of its operators. Another factor behind its top scores may be its size: this Baltimore facility has just 32 certified beds - all occupied, at last official count. Attractive as this facility appears, based on its inspection scores, we should not be surprised it has no vacancies. It stands to reason that it is easier to maintain high quality at a small facility than at a large one: if you have only 32 residents in total, you are not apt to face as many challenging circumstances as a facility with five times as many. This blanket statement is an oversimplification because there are economies are scale that can some logistical things tougher or smaller nursing homes. But it is largely true that smaller nursing homes generally do better than large ones if you look at the Medicare statistics. For whatever reason or combination reasons, Maria Health Care has attained some remarkable records. Its last standard health inspection, in November of 2015, turned up zero deficiencies: hardly any facility anywhere can match that. Maria Health Care got five stars for staffing even though this facility was just about average in terms of the total nursing time per resident per day (2 minutes under the national average). But this facility placed great emphasis on RN time: over half an hour longer per day than either the Maryland or U.S. averages (Maria got a 5-star rating for RN staffing). It also emphasized time spent by certified nursing assistants (about an hour and a quarter more per resident daily than the state and national averages). It provided about an average amount of daily time with physical therapists, but only minimal time with LPNs and LVNs (licensed practical nurses, licensed vocational nurses): a mere nine minutes per resident per day (about one-fifth the state and U.S. averages). Maria Health Care appears to prioritize its categories of nurse staffing. The Medicare category of quality measures brought yet another 5-star rating. In this category Maria Health Care starts showing in real detail why it got five stars for everything. In five of nine measured categories for short-stay residents, Maria was not only good but extremely good. Short-stay residents here had no problems with pressure ulcers (bed sores): zero percent occurrence. Better than nine in ten residents (91.3 percent) improved their functionality (versus about six in ten, on average, statewide and nationally). Only 3.3 percent of these residents reported having significant pain; the averages for Maryland and the U.S. were four to five times higher. All of these residents got flu shots, and nearly all got shots for pneumonia. This facility carried its stellar performance into the category of long-stay residents. All of them got flu and pneumonia shots. None of them were subjected to physical restraints. None of them required ongoing catheterization. Needless to say, this facility beat the state and national averages on these points. Practically none of these long-term residents had urinary tract infections (1.7 percent), and practically none reported having severe pain (0.8 percent); again, this facility thoroughly crushes the state and national averages. Its long-stay residents also had significantly fewer pressure ulcers or falls with injury than average (two events that are the genesis of most Maryland nursing home cases). Maria Health residents were more likely to maintain their independence in daily activities, and less likely to need anti anxiety meds, or lose too much weight. But nobody's perfect. Long-term residents here were a bit more likely to experience a decline in their mobility, and they were far more likely to be incontinent (78.8 percent, versus 58.5 percent for Maryland, 46.8 percent nationally). And - most notably, these Maria residents were much more apt to be depressed: 13.6 percent of these residents had depressive symptoms - well over twice the state and national averages. Still, if Maria Health Care were to expand its operations and create a few more vacancies, we doubt this facility would have a hard time filling them. Chestnut Green Health Center - Blakehurst: This Towson facility almost matches Maria Health Care (getting four stars rather than 5 for nursing) and truly is a competitor. Lochearn Nursing Home, LLC: Lochearn does represent real competition to Maria Health Care: although its Medicare ratings are not quite as high, it has 200 certified beds -- versus 32 at Maria. Lochearn has managed to achieve excellent Medicare scores (including five stars overall) but on a much larger-than-average scale. Transitional Care Services at Mercy Medical Center: This Baltimore facility, located very near Maria Health Care, got an overall 5-star rating and 5 stars for staffing. It would be even more competitive with Maria if not for its below-average rating on quality measures. Powerback Rehabilitation: Located in nearby Lutherville, Powerback got Medicare scores identical with those of Transitional Care Services, so it offers a comparable amount of competition to Maria Health Care. Crawford Retreat: Located very close to Maria Health Care in Baltimore, this facility got only a 4-star overall rating, but it did get 5 stars for quality measures, and thus it does pose some real competition to Maria. Oak Crest Village: Like Crawford Retreat, this Parkville facility got 4 stars overall and 5 stars on quality measures - making it a very plausible alternative if Maria Health Care Center has no vacancies. Maryland Baptist Aged Home: Same story again: 4 stars overall, 5 stars for quality measures at this Baltimore facility. But Maryland Baptist got only an average rating for its health inspection and a below-average rating for staffing. FutureCare Sandtown-Winchester: Here is yet another Baltimore facility with an overall 4-star rating and 5 stars for quality measures. FutureCare Sandown rated at least average in the other two main Medicare categories, so it can compete on some level with Maria. Fayette Health and Rehabilitation Center: Fayette got almost straight 4-star ratings from Medicare, making it a good possible "second choice" for those who can't get into Maria Health Care. Augsburg Lutheran Home: This Baltimore facility did match Maria Health Care for 5 stars on quality measures - a very good achievement. But its 3-star overall rating and other Medicare scores put it decidedly a notch or two below Maria. Brinton Woods Post Acute Care Center: Located less than half a mile away in Baltimore, this facility got a more-than-respectable 4-star Medicare rating overall, but its 2-star rating on quality measures can't compete with Maria's 5 stars. FutureCare Canton Harbor: This Baltimore facility's Medicare ratings are thoroughly respectable; overall, it is rated above average. Maria Health Care simply did better. Northwest Healthcare Center: Better than average on quality measures, this Baltimore facility nonethess was rated below-average by Medicare overall. Brinton Woods Health & Rehabilitation Center at Arlington West: This Baltimore facility received Medicare scores very comparable with those of Northwest Healthcare Center. Manorcare Health Services - Dulaney: Manorcare does match Maria's 5 stars on quality measures, but this Towson facility comes in a distant second on the rest of the Medicare scores, including its 2-star overall rating. Riverview Rehabilitation & Health Center: Aside from its 4-star rating for its health inspection, this Baltimore facility was rated below-average (or worse) in three of the four main Medicare rating categories. Bridgepark Healthcare Center: Bridgepark got 4 stars on its quality measures but scored much below Maria on everything else (including its overall 1-star rating). Milford Manor Nursing Home: Milford Manor is much the same story as Bridgepark: it got one 4-star rating (in this case, for staffing), and the rest of its Medicare scores were terrible (1 star in three categories). Envoy of Pikesville: This Pikesville facility got the bottom 1-star rating overall; its best score was 3 stars for quality measures. Little competition for Maria here. Overlea Health and Rehabilitation Center: Same again at this Baltimore facility: it got an overall 1-star rating, despite average ratings for staffing and quality measures. Cromwell Center: Here's another 1-star Baltimore facility that poses no significant competitive threat to Maria Health Care - or most anybody else. Loch Raven Center: Here again is a Baltimore facility whose abysmal scores (including 1 star overall) render it hardly competitive with anyone. Have you or someone you love suffered harm (or killed) in a Baltimore nursing home? This particularly nursing home is a very good facility. But even good nursing homes can make fatal errors. If you think you may have a claim, call our Baltimore-based nursing home lawyers at Miller & Zois today at 800-553-8082 or get a FREE no obligation case review. 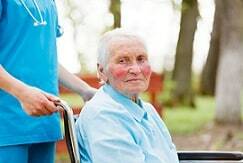 How much money can you expect in a nursing home cases? Victims and their families want to know. Get nursing home case settlement value information and learn how juries and insurance companies place a dollar amount on these cases.